Are you tired of wearing the same old puffer jacket every winter? Do you want to add a certain pop to your wardrobe without exerting too much effort? Maybe it’s time that you invest in a hanten. These comfortable coats have been worn for hundreds of years, and remain in-style to this day thanks to their simple yet effective design. If you are feeling lost in regards to where to start, this helpful guide will have you snuggled up with a brand-new hanten in no time! We'll explain how they came to be, where you can buy a hanten jacket, and what to consider when buying them. Hanten first became popular during the 18th century, or the later part of the Edo period. Unlike other haori (see below) hanten could be worn by anyone, and for various occasions. It was not only utilized in the winter, but also at night or during a festival. Thanks to the lightweight design, it provided both warmth and breathability, making it a very useful article of clothing. What is the Difference Between Hanten, Happi and Haori? Visually, a haori is very close to a hanten. It is hip-length, and worn over the kimono. During the Edo period, the wearing for haori was restricted to certain social classes, while happi and hanten were widely available to all. Haori can be very formal depending on fabric and construction. The Edo authorities frowned of overt displays of wealth, so the more decorative parts were usually reserved for discreet lavish linings, which are still apparent in haori worn today. A happi, on the other hand, is usually a more simple design woven in cotton, and meant to be very casual; meaning not worn over kimono. While commonly dyed in a single color, they often are adorned with large kanji or other symbols on the back to label groups, companies and events. Even today, happi are worn during festivals by locals or donned by more traditional laborers. From the beautiful woodblock prints by Kunio Kaneko that you can see above, it is clear how well the practical design of a traditional fireman’s happi is transplanted into the elegance of fine art. You can see more of his works at Sakura Fine Art. 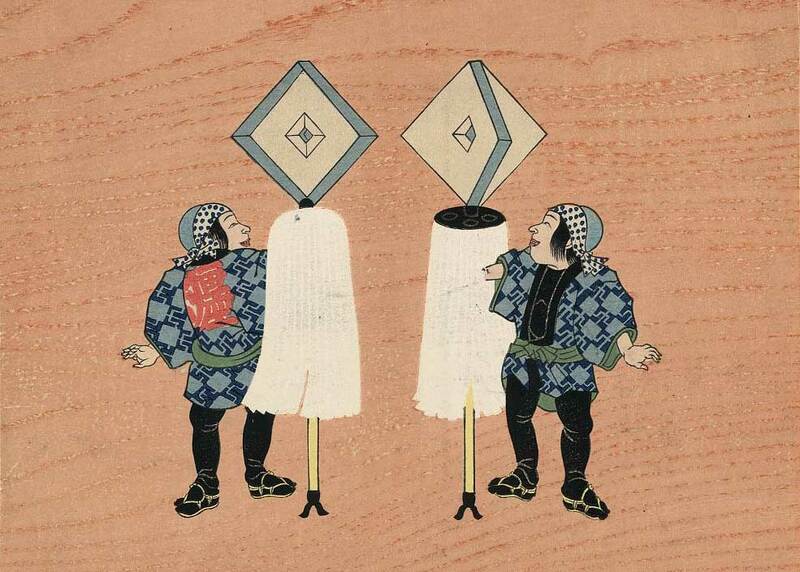 The difference between happi and hanten is less clear cut, as the two garments look very similar. Historically a happi was usually used as a form of uniform, whereas a hanten is more a padded coat to keep out the cold. However there is lot of overlap between the two styles and today many people use the terms interchangeably (see here for more detail in Japanese). How to Wear a Hanten? These coats may have evolved over traditional Japanese apparel, but the simplicity of design means you can wear them with any outfit. People often use them with casual wear, or even pajamas, due to the versatility of the piece. In Japan, many homes do not have central heating, so a hanten, which is warming but not bulky, is the perfect outfit accessory to stave off high electricity bills. It is also so comfortable that it can be worn while studying or reading, attending festivals, or even at the convenience store. What to Look Out for When Buying a Hanten? When buying a Japanese hanten, a lot comes down to personal preference. Maybe you like a subtle, yet elegant style to weave into your stylish wardrobe. An inner tie allows for a snug fit, and its lightness assures easy mobility. For those who aren’t looking to venture far in terms of fashion, maybe a more traditional coat is the way to go. The materials of this item make for a warm protective layer that is non-constricting. It is both sturdy and reliable. You can buy this men’s hanten jacket at Amazon here. When making a selection, quality is the most important thing to factor. Garments made of pure cotton and natural fibers are the best for your skin and your hantens’ livelihood as it ages. Be on the look-out for pristine stitching as well, because you want it to last for as long as possible. Thankfully, most sellers take pride in their work; there are thousands of unique and high-quality styles to choose from all over Japan and online. We recommend these hanten coats from Japanese brand Watanosato because they are well-made in traditional fabrics, so they will last you a long time, keeping your warm for many winters, and they are very reasonably priced. There are various designs and patterns to choose from, and they are available in a good range of sizes to fit most people. A brightly colored coat like such as the one above has a light, simple pattern, and is perfect for wear year-round. The fabric is vibrant and easily hand-washed. It also comes in a variety of different hues to match your specific taste. You can buy this one on Amazon here. The darker subtler colors of this hanten would be suitable for a whole range of occasions, whether you want to blend it with your winter-hued outfit, or as a stand-out piece over jeans and T-shirt. You can buy this jacket at Amazon here. If you're still hungry for more information, watch this video to find out exactly how these jackets are made. Now that you are well-versed in all things hanten, it is time to upgrade your style. This traditional garb has survived through the ages, and although it has evolved, the basic principles still stand. A hanten is the perfect way to appreciate Japanese culture and feel comfortable while doing so. Winter may be a few months away, but it’s never too early to get cozy!